In behavioral finance, the ostrich effect refers to investors’ tendency to dislike receiving information on potential interim losses. In other words, when we are experiencing a bear market, we tend to ignore bad financial situations by pretending they don’t exist. During such environments, we tend to stick our heads in the sand. The reason is simple. Knowing that a portfolio lost a lot of money is more painful than just suspecting it did. If we don’t know for sure how our holdings are performing, we can always retain the hope that they didn’t suffer as much as we expect. While ignoring these potential interim losses in this way does not make them go away, pretending they aren’t there makes you happier. One ‘advantage’ of the ostrich effect is that it might avoid you from acting on your emotions. Research has shown that the more news investors receive on their current holdings, the more they tend to trade and the lower their performance. By temporarily ignoring bad financial news, we might actually be avoiding a lot of the other behavioral biases that negatiely impact our investment performance. In particulare, we will be less likely to engage in fire sales and herd behavior. Still, ignoring bad news can also make things worse. Confronting the issue and taking action might be needed in order to avoid further losses. 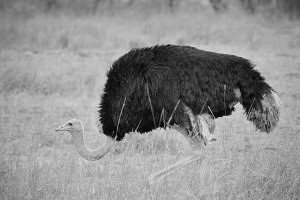 Moreover, the ostrich effect might also induce us to hold on to losing positions, contributing to a disposition effect. Ignoring bad news does not make it go away. However, bad news often causes investors to overreact. In that sense, ignoring bad news in the short run is not very detrimental to performance.